Channel 4 has launched its new digital channel More4 with a satire about politician David Blunkett. A Very Social Secretary documents Mr Blunkett's affair with publisher Kimberly Quinn. Billed as an "adult entertainment channel" for the over-30s, More4 is available to viewers with satellite, cable and Freeview. The channel says it aims to show "the best of documentaries, smart films, quality news and contemporary drama". Series six of the White House drama The West Wing will make its debut on More4 in a regular peak-time slot, and there will also be premieres of brand new shows and the new series of Curb Your Enthusiasm. Exclusive spin-offs from favourite Channel 4 programmes will also be shown on the channel. More4 joins Channel 4's existing spin-off channels E4 and FilmFour. Other highlights include new topical talk show The Last Word, a documentary series by Super Size Me director Morgan Spurlock, and the UK TV premiere of Downfall, the Oscar-nominated German film about Hitler's last days. Lawyers acting for Mr Blunkett wrote to Channel 4 to express concerns about A Very Social Secretary, however the 90-minute drama is still due to be broadcast. 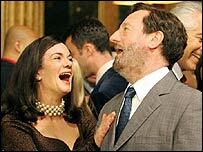 Mr Blunkett is played by Boys From The Blackstuff actor Bernard Hill, while Ms Quinn is played by Victoria Hamilton. Prime Minister Tony Blair and his wife Cherie are played by My Family's Robert Lindsay and Smack The Pony star Doon Mackichan.